After our roadside fiasco involving three days of expensive mobile mechanic repairs while attempting to depart Yellowstone National Park, we were eager to get back on the road towards Grand Teton, hoping for a better RV experience than Fishing Bridge campground had provided. After a bit of research we had resolved to drive all the way through Grand Teton to the southernmost campground, Gros Ventre, owing to the online reviews which suggested it would be both available and more to our liking than some of the others. Due to the lateness of our departure from our parking lot repair site at Flagg Ranch, however, we elected to stop well short of Gros Ventre, spend at least one night at Colter Bay campground, and extend the stay if it was to our liking. It was fine, but not great enough to keep us from continuing on to Gros Ventre the next morning and staying there for two nights. Colter Bay campground is in the northern section of Grand Teton National Park and conveniently located right off the main park road. They also have a small store for basic supplies and a restaurant at the front of the campground, which we failed to take advantage of since I assumed there was something similar down the road at Gros Ventre. There was not, oops. They only had dry-camping spots available, though spaces in both the “generators permitted” and “no generators” sections were open. We elected the former, even with limited permitted operating hours, since we preferred to keep our fridge cold and get our house batteries fully charged. The campground was heavily wooded, but our site, like many, was one of those pull through spots that is just a long wide pullout directly beside the loop road. The organization of the campground made it seem more crowded than it probably was because families and kids on bikes were constantly driving right by our side windows. It was fine for a one night stop, and for those with tow vehicles it might be a great place to use as a base camp to explore both Grand Teton and Yellowstone, but it was not our preferred place. We moved on to Gros Ventre at the southern end of the park, enjoying the scenic pull offs along the way. Gros Ventre is French, so avoid giving yourself away to the locals too easily by pronouncing it the way it looks, “Grose Ventry,” and instead use the tortured French pronunciation, something along the lines of Grow Vaunt. The campground is a dozen or so miles off the main highway, has no camp store of any kind, and had only dry-camping available, again with choice of generator or no generator sections. 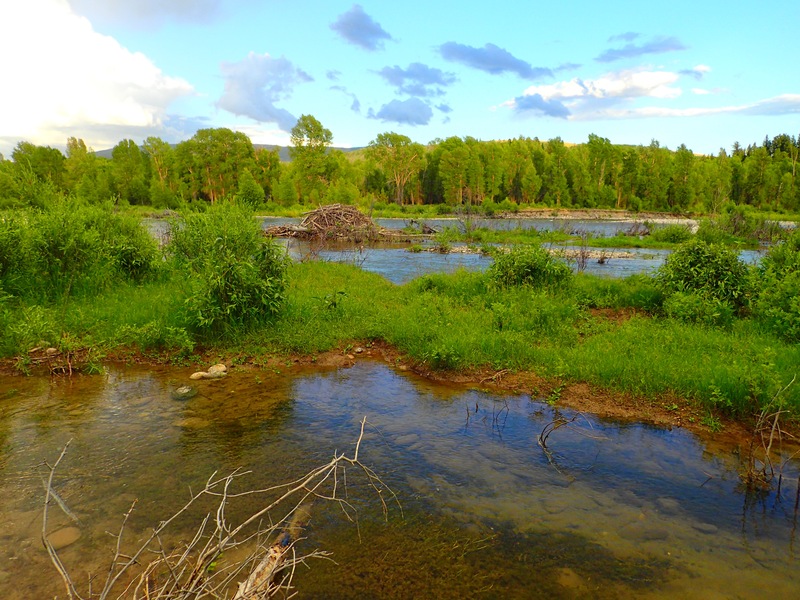 The sites were much more spacious and spread out, mainly large back in spots, and the Gros Ventre river was just a hundred yards or so behind our site. 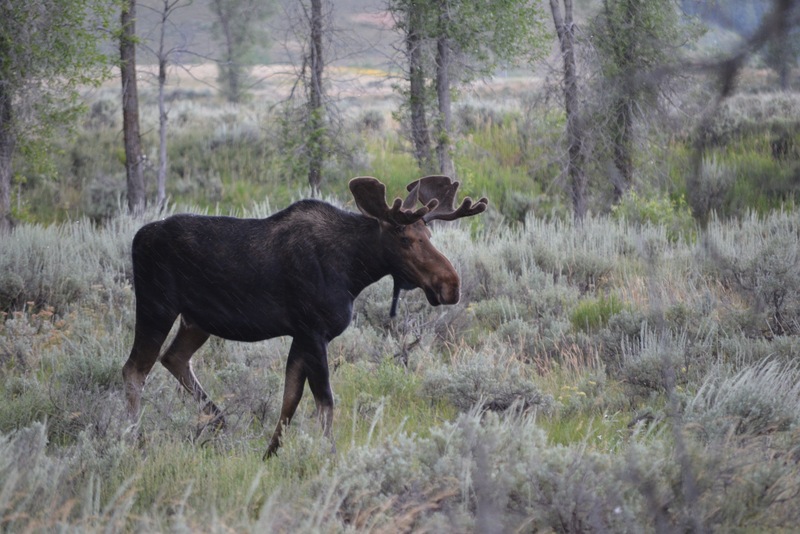 The somewhat more isolated and spread out nature of this campground seemed to lend itself to better wildlife spotting; we had a pair of bull moose wander through the campground on our first evening. Though we only had dry camping spots, our overall RVing experience in Grand Teton was far better than that in Yellowstone. Sometimes you need full hook ups, or at least electricity, but we are learning that the contracted, reservable, and full hook up campgrounds in the national parks tend to be overpriced and not particularly attractive. From here on, where feasible we will aim for the park operated dry camping sites when in the NPs. Between the two Teton campgrounds, Colter Bay and Gros Ventre, we preferred the later due to the larger and quieter sites, though the camp store at Colter would have been a great asset had we chosen to remain there. All in all we had a better time in Grand Teton than Yellowstone, particularly the campgrounds, but I can easily see us returning to the area and giving Yellowstone another go, this time in a tow vehicle or rental car.